Here's a social channel you might be overlooking. I’ve personally always been a huge fan of Google+, but it’s been several years since I’ve been consistently active: It simply became too difficult to keep up with posting. Has the same been true for you? I’ve always known that Google+ is good for SEO reasons, personal branding and content sharing; I just found myself moving more naturally toward Twitter, LinkedIn and Facebook -- networks that I could use Buffer to manage all of my posts and share similar content. 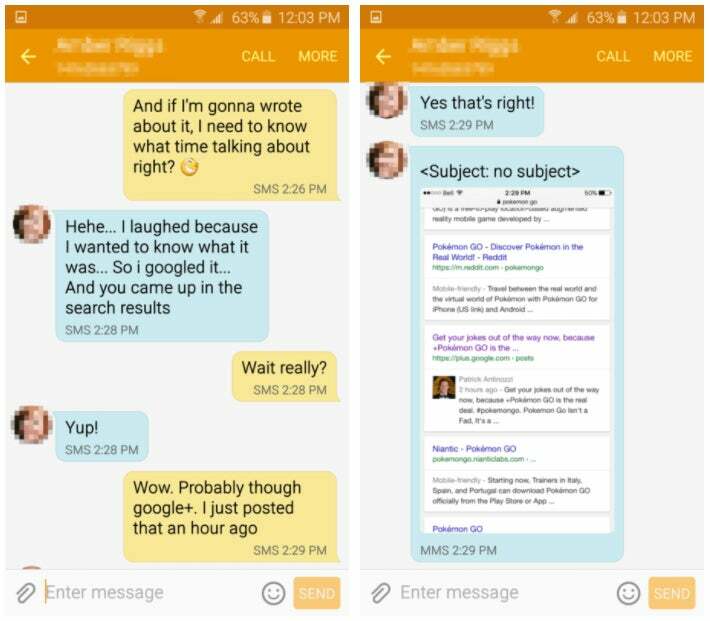 Sharing to Google+ natively was too much of a stretch from my regular routine of scheduling everything in one place. Well, I’m excited to share some good news and some helpful G+ tips. 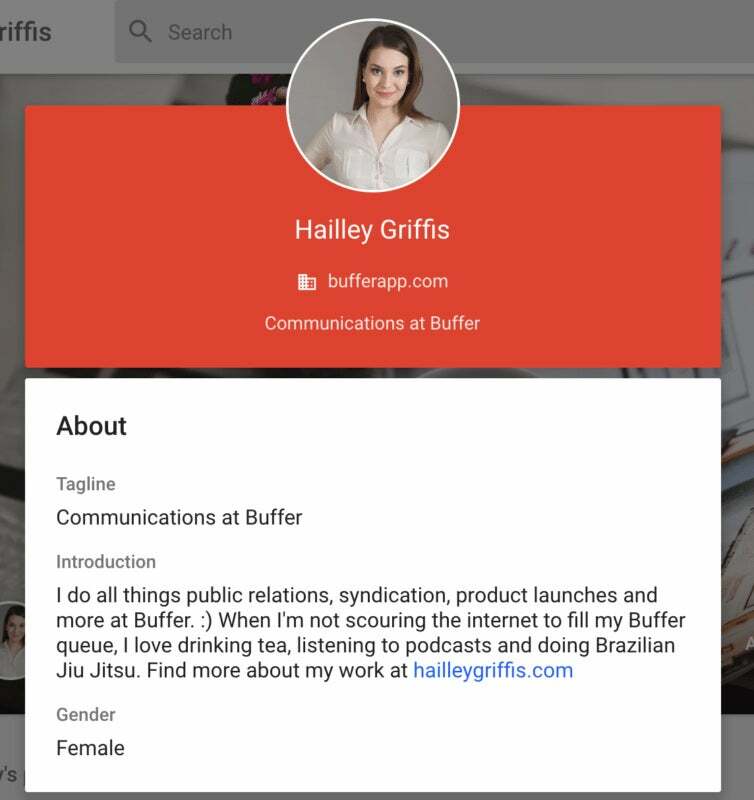 Now, you can connect a Google+ account to Buffer, which we hope will make your Google+ brand even stronger. 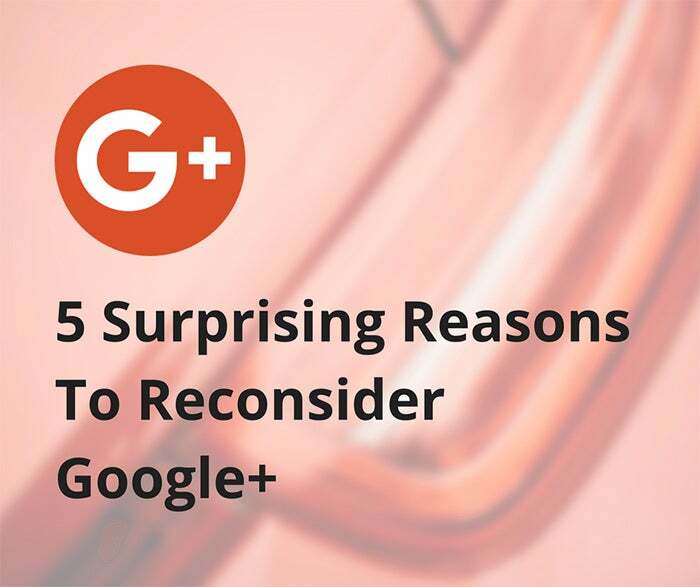 And if you’re still on the fence about the future of Google+ or its value to marketers today, I’d love to share five reasons why Google+ could be interesting for you to try. Now, onto the five good reasons to make time for Google+ posting. Sometimes it happens without even realizing it. Such was the case for Patrick Antinozzi of Rapid Web Launch who ended up in the search results for Pokémon Go thanks to his Google+ post. How does this Google+ ranking boost happen? Content that you post to Google+ is far more likely to show up in search results than other pages, websites, articles and content posted to other social networks because Google ranks their own social network higher and they crawl it faster. The added benefit is that Google even previews certain Google+ posts with rich snippets (profile picture, media etc. ), giving them even more real estate in a search! Well, you do need to build a network on Google+ using Google+ Circles. The more people you add to circles and the more people who add you to their circles, the more likely you are to show up in search results for your network. Imagine if every person you emailed got added to a Google+ circle? You’d have a list of friends, family, colleagues, prospective leads, business partners and much more who would see your content first! The broader your network on Google+ the more likely you are to show up in search results. How can you take advantage of this? It’s pretty simple! 1. Make sure your Google+ personal profile and/or your Google+ page is fully complete. Why bother? Well, Google indexes this information. This is an ideal place to make sure that Google knows who you are (and for those who find you on Google+ to know where to click to learn more). Head to your Google+ personal profile, hit “Edit Profile” then click the “I” icon to go to your About Me page. After you claim your custom URL (you can follow the instructions here for desktop and mobile), it’ll be even easier to extend your branding into the search results since Google indexes the URLs too. This is the fastest way to get your URL indexed and crawled to rank on Google search. Take care when sharing to Google+ to include the full title of post and even a small description to make ranking even more likely to be indexed and ranked. The more people you have in your circles, the more likely you are to show up in search results! 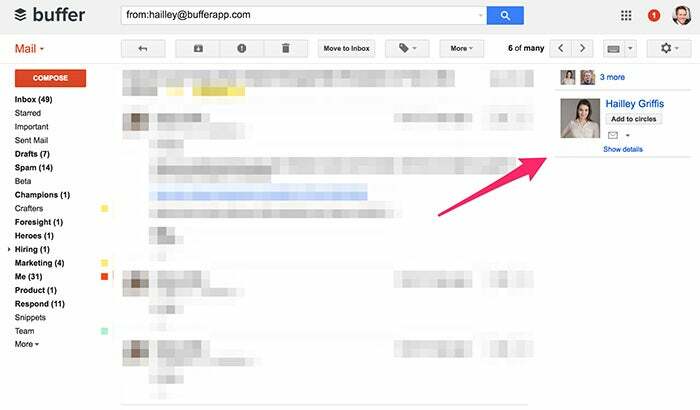 One idea: You could add everyone you email to a Google+ circle. One billion people use Gmail every month. Are you one of them? If you aren’t, you’re probably emailing with a bunch of them! And here’s the great benefit of Google+ and Gmail: Your Google+ profile appears in every one of the emails you send, for whoever opens your email in Gmail on desktop. Have you ever tried clicking on someone’s photo in an email and had it take you to their Google+ profile? I’ve done that quite a few times when I’m looking to find out more about someone, and it’s always awesome when their bio is filled out and from there I can find their website, other social handles or just generally learn more about them. How can you optimize this? This way if your profile gets clicked, it contains all of the relevant information someone might be looking for and is a strong start to making sure your profile and content shows up in search. Bonus: Maintaining an active presence on Google+ will also give people more content to click through and more context to learn about you. It’s hard to pin down exactly how many people are using Google+, recent numbers say 375 million monthly users, whereas other places mentions between 4-6 million active users and in total there are 2.2 billion profiles since every new Gmail account ends up creating a Google+ profile as well. It looks more likely that people enjoy using Google+ to host their photos, with 1.5 billion photos uploaded every week. I’ve done this myself as not all of my friends and family are on Facebook or Instagram, but they all have Gmail and can view the photos that way. Regardless of how many people are using Google+, they are an active bunch. Google Communities in particular now average 1.2 million new joins per day! What I found most interesting is the key demographics from those active Google+ users. 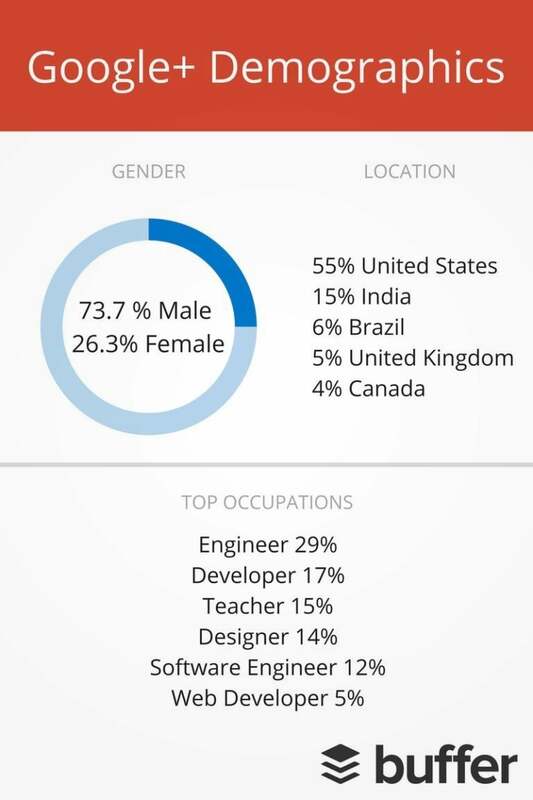 It’s common to hear that Google+ is great for reaching people in tech and it could be true based on these demographics. Based on stats describing the top occupations, it’s likely 78 percent of Google+ users work in a role related to tech. If that’s your target audience, then you’ll definitely have a higher likelihood of reaching them. Even if it isn’t, Google+ still has millions of active monthly users, who’s to say they won’t be interested in your brand or company? Google recently released the numbers for communities on Google+ as having 1.2 million daily new community joins. When you’re a member of a community, you can post to that community. Members of that community may see your posts in their home stream. If you’re still starting out on Google+ and don’t quite have a following yet, posting content to communities is a great way to build an audience. Some workplaces also use Google+ communities as an internal social network for employees. Scrolling through Google+, I easily came across many brands and influencers who have enormous followings. NASA and National Geographic use Google+ to share stunning photos, the Dalai Lama shares his message with nearly 7.5 million followers and gets great engagement, Evernote has a colorful profile with popular, active collections and communities on their page. Google+ is a great space to build a following with a lot less competition and noise than some other social networks. The added benefits from SEO ranking and visibility in Gmail, make it all the more attractive.